I'm not quite sure what to call this. Maybe you can help me out in the comments. 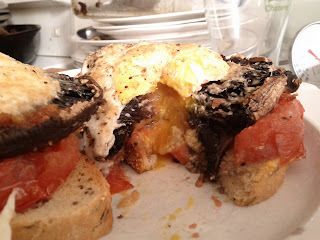 It is my take on eggs florentine but without the poached egg, spinach, hollandaise sauce, or english muffin. Instead, I used portabella mushrooms, tomatoes, parmesan cheese, and a broiled egg. Preheat oven to 400F. In an oiled pan, roast the mushroom caps for a few minutes while you prepare the other ingredients. When slightly softened, remove from the oven. Crack the eggs into the mushroom caps, top with salt, pepper, and cheese. Add sliced tomatoes to the pan. Broil until cheese browns. 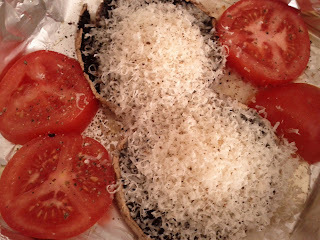 Remove tomatoes to cover toast. 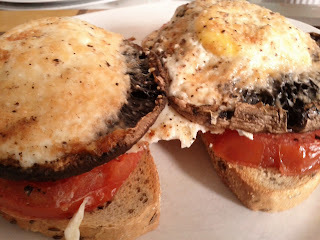 Top with mushroom caps, serve immediately, eat and enjoy.